The Samsung Galaxy Note 8.0 has been discontinued. No direct replacement is available. The Samsung Galaxy Note 8.0 works at your pace. Be productive at work, at home, and on-the-go with the integrated S Pen™ and Office Suite. Multitask, collaborate, and share right from your tablet any time. You can bring your own device to work, thanks to the enhanced security, accessibility, and connectivity features. 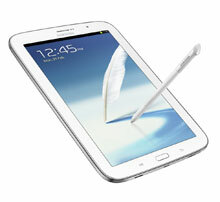 Samsung Enterprise solutions make the Galaxy Note 8.0 safe to use at work, and keeps company data secure. 8" Screen, 2GB, Samsung Exynos 1.60 GHz, Wi-Fi, Bluetooth, Android 4.1 Jelly Bean. Includes AC Adapter.